The Yamaha Rev1 is a professional digital reverberator with 1 input and 2 outputs. Various reverberation effects can be added to original sounds by allowing early reflections and subsequent reverberation to be indenendently controlled and mixed together. The Yamaha Rev1 is a highly refined system which offers superb performance and is well suited for use in halls, recording studios, broadcasting, and for sound reinforcement applications. The Yamaha Rev1 is a digital reverb unit which meets all requirements for use in halls, recording studios, and broadcasting stations. The frequency response of the Yamaha Rev1 is from 20 Hz to 18 kHz, distortion is below 0.03%. and the dynamic range is 85 dB in reverb mode. The Yamaha Rev1’s proprietary large scale integration (LSD chips) for signal processing, and a micro computer, allow subsequent reverberation of high quality. and up to 40 early reflections (L, R each) to be independently controlled and programmed. Also, use of the remote control unit enables user control over elements such as sound directly from the source, early reflections bouncing off surfaces, as well as subsequent reverberation, in which the reflections are multiplied, to be perfectly controlled. Thus, the delicate natural acoustic properties of concert halls can be accurately simulated. Early Reflections – Any one of eight different early reflection modes can be selected. Initial delay can be set up to 600 msec, in steps of 1 msec. Accurate simulation of the natural acoustic properties of virtually any environment is made possible through the free control of settings for: room size (volume of room), the number of early reflections, an acoustic absorption coefficient of walls. Subsequent reverberations – Any one of eight different subsequent reverberation modes can be selected. The delay time between direct sound and subsequent reverberation can be set up to 600 mseci in stalls of 1 msec. Reverberation time can be selected from 0.1 sec. up to 99.9 sec. at the mid-low frequency band. Also, reverberation time can be adjusted differently in each of the four frequency bands (high, mid-high, mid-low, and low). The unit makes available 30 pre-set memories. They include such settings as: “LARGE HALL”, “HAND CLAP”, “PERCUSSION PLATE‘, and “CHORUS”. In addition, the user can store modifications of these pre-set programs, or his own program in any of the 69 user-programmable memories. The user can enter data easily with the ten numeric buttons on the main unit, a ten-key numeric pad on the remote control unit, and the “UP” and “DOWN” keys and buttons. The data being entered can be monitored on 3-digit, 7-segment LEDs on the main and remote control units. as well as a liquid crystal display (LCD), on the remote control unit. This assures a precise level setting and a wide dynamic range for the Yamaha Rev1. On the front panel of the main unit, the input can be monitored, as well as on the remote control unit, with which both input and output can be monitored. Use of the remote control unit on the Yamaha Rev1 enables the following three elements to be perfectly controlled: direct sound; early reflections; and subsequent reverberation. By varying the settings for these three elements, the natural acoustic properties of concert halls can be accurately simulated. In addition, the remote control unit is equipped with a lighted 64 x 240 dot-matrix liduid crystal display (LCD). Any one of eight different graphical display modes [or such values as reverb waveforms (W/F) or reverb time (R/T) can be chosen to aid in the setting of data. Reverb time has two different displays: Delay 1 and delay 2: and there are displays for the law and high Pass filters. 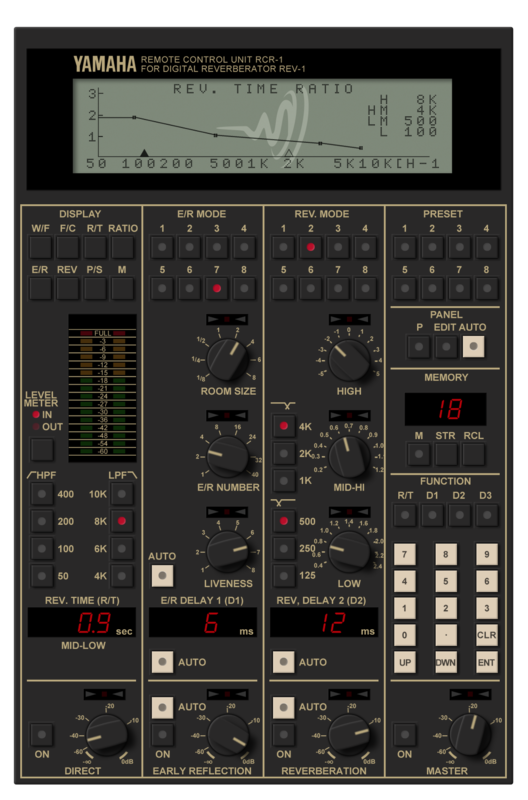 The Yamaha Rev1 is equipped with a terminal which enables computer control (RS-232C compatible). a terminal for an external word clock, and were is an optional terminal for digital 1/0.